Click to go to the next section in this guide. Click to go to the previous section in this guide. Click to return to the table of contents. This section will explain how user roles and unit hierarchy within Interfolio Faculty Search allow institutions to facilitate their committee's decision-making process. Units - Different tiers within the hierarchy – Schools, Departments, or Divisions. Each unit is made up of Administrators, Committee Managers, and Committee Members. Within the Interfolio Faculty Search and Review, Promotion, and Tenure, a user's role define's their capabilities. All users are added as an evaluator, by default, and then have to be assigned to specific positions in order to view and access applicant materials. In this section, we will dive deeper into these concepts. Institutional Administrators - Can control settings and view positions, applications, and reports (including EEO if enabled). Administrators - Govern and manage an assigned unit within the institutional hierarchy. There can be multiple administrators assigned to a specific unit (college, school, department). Administrators can create, manage, and report on searches at their unit or any unit nested below. EEO Officers - Can monitor and run EEO reports. They can also flag positions that do not meet diversity requirements. Committee Managers - Can create and manage searches within a given unit in which they have been assigned to. They can communicate with applicants, control search settings, apply statuses, add applicants and applicant documents and create search reports. Evaluators - Are assigned to search committees. Once assigned to a committee, Evaluators can review applications including all documentation and custom form responses. When reviewing applicants, evaluators can apply tags and evaluate applicants using a five-star rating system. In addition to being able to replicate the organization of your institution for user management, it is important to have an accurate organizational hierarchy, because hierarchy is directly related to system settings within Interfolio Faculty Search, in addition to determining report groupings. Interfolio Faculty Search can be set up to exactly mirror the organizational hierarchy of your institution. The users that are available to be added to a search as a committee manager, or that have control of administrative settings for a given search, are maintained through the unit hierarchy. Administrators and committee managers are assigned to units to manage the search. As an Administrator, you will have control of the settings for units at or below your level of access. For example, a university might contain colleges or schools, which in turn contain departments or programs. Any organizational structure is possible, and Administrators can add a unit at any point in the hierarchy. The image below is taken from the Administration page, and shows how an institution may build out their organizational structure. It is possible to push down settings, default forms, statuses, and more to the units beneath it, or allow them to set their own for a more decentralized institution. Some institutions build the hierarchy exactly as their organization is structured, which can be very complicated and detailed, but others design it more simply to fit their needs. Department of Critical and Comparative Studies in Music. During implementation, Interfolio will assist by bulk uploading users to the system. Alternatively, users can be added through the system by way of the API. Last, users can be manually added to the system. Administrators can add sub-administrators and they then can continue or can add committee managers, and then either user can add the other potential committee members or 'evaluators'. For example, Administrator-A can add an administrator beneath them, Administrator-B. Administrator-B can add Administrator-C. An all of them can add the relevant users and committee managers for their own unit. 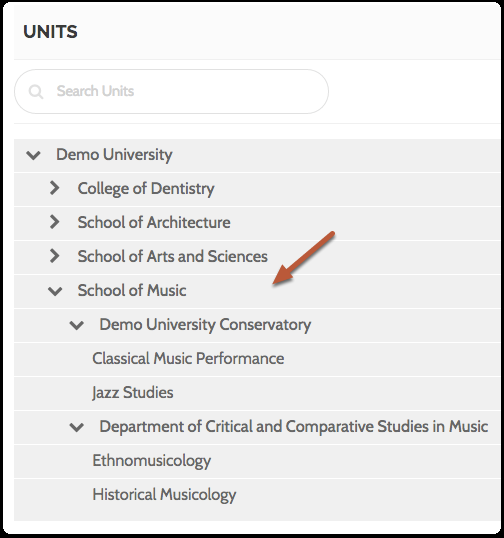 Setting Up Units - Ensure that your institution's hierarchy is up to date and matches your institution's workflow. User Roles in Faculty Search - Keep user roles up-to-date and accurate to ensure efficiency and efficacy at the institution. Editing a User's Role - On the same page as manually adding users, you can quickly and easily edit and manage a user's role, assuming you have a higher permission set them. Resend Invitation Email to Faculty Search User - On the same page as you edit a user's role, you can quickly resend a user's invitation to access and set up their account within Interfolio Faculty Search. Customize Branding and Logos of Interfolio Faculty Search - On the Administration Page in Interfolio Faculty Search, you can customize the branding and logo of the related institution.